BC Basement Systems provides crawl space repair and encapsulation, basement waterproofing and radon mitigation services for homes in British Columbia. We have the knowledge and expertise to find out the source of your wet basement or moldy crawl space problems, and provide the right solutions for your home. Do you have leaky basement walls, musty odors, condensation or crawl space moisture? We're trained and certified to handle even the toughest jobs. We service homeowners in Kelowna, Kamloops, Vernon and surrounding areas. We have the most effective solutions for wet basements. Protect yourself by preventing mold growth before it begins! Our sump pump systems are engineered to get water out. We offer a free, in-home inspection and cost estimate for all our "Basementy" services. From basement waterproofing to foundation repair, we can offer financing options for practically any job. We are the region's authorized Basement Systems dealer and trusted waterproofing and crawl space encapsulation contractor. Our waterproofing and crawl space repair products have been tested, proven and patented, and come with warranties to ensure that your home is protected. The same proven waterproofing and crawl space vapor barrier systems that we use have been installed in homes all across North America. If you need radon mitigation, we're British Columbia's qualified professionals. "We're professional and seemed competent on telephone..."
For more than 20 years, we've provided quality, proven crawl space repair, basement waterproofing, radon mitigation and sump pump installation. We have positive reviews from hundreds of British Columbia homeowners just like you who were dealing with leaky basements, damp crawl spaces or high radon levels. 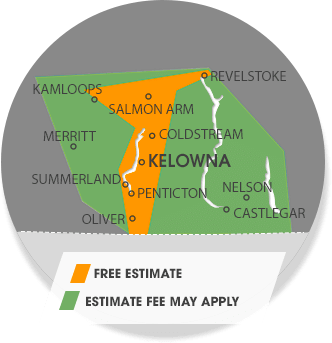 We serve homeowners from Kelowna all the way to Penticton, Quesnel, Nelson, Williams Lake, West Kelowna, Salmon Arm, Castlegar and nearby. Give us a call today for a no-obligation inspection and free estimate.